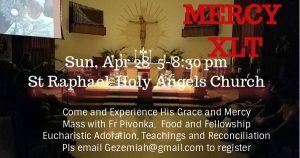 St. Raphael-Holy Angels Parish warmly welcomes you to our parish community. We want you to know you can find a spiritual home with us. We invite you to enjoy our website and find information about our worship services, school, Faith Formation programs and parish organizations. 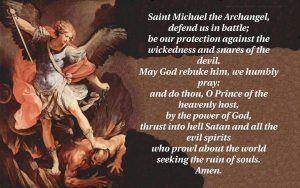 St. Raphael-Holy Angels Parish is a place of hope and healing, the place people turn to in times of need. We are a community of caring, faithful Catholics dedicated to service, worship and prayer, religious education, and works of charity. We offer ministries for adults, elderly, youth and children where you can form new friendships to support and encourage you to a deeper relationship with Christ. Welcome home! We look forward to meeting you and worshipping our Lord together. Contact us with any questions. Discover a purposeful and meaningful life, take an active part in our parish community. Click on the Ministries tab and see the many ways to get involved. By becoming the answer to someone’s prayer, we often find the answers to our own. 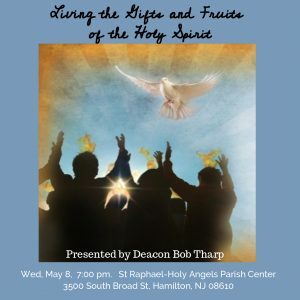 >>Click here to watch the slideshow of music from the St. Raphael-Holy Angels Music Ministry. Calling creation to celebrate life! for Jesus is risen! 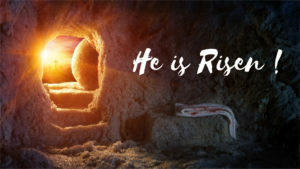 Alleluia He is risen! 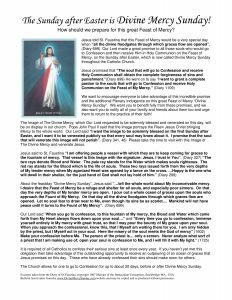 Sunday, April 28 is the Feast of Divine Mercy! >>Click here to take a look at a short clip of Fr. Pivonka. Once again you are at the door and knock. Rouse us! Purify and illumine our hearts! Enter into every home of our parish. Strengthen those who seek to be near you. May no one refuse your invitation, Lord. as you are so merciful to us. we entrust to you this time of mission. May it produce abundant fruits in our Christian life. 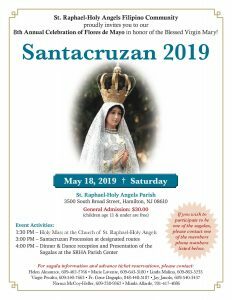 Calling all Youth and Young Adults of the Diocese! 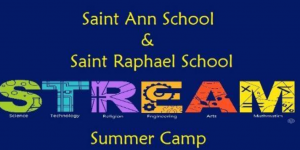 STREAM Summer Camp Open to the Public! Parishioner in Need of a Liver Donor – A parishioner is in need of a liver donor. To be a liver donor you have to be between the ages of 21 and 50, in good physical health and have a BMI (body mass index) of 30 or less. You also need to be type A+ or o+ blood. Want to save a life? Be a donor. 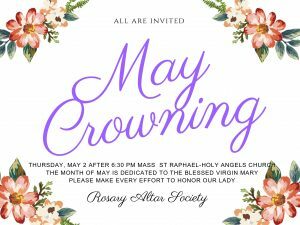 Contact the rectory at 609-585-7049. If you would like a minister of Holy Communion to bring Communion to you in your pew or wheelchair, would you or a relative, friend, or other Mass attendee please contact one of the Ushers before Mass, so that one of the Ushers can lead one of the Eucharistic Ministers to you. 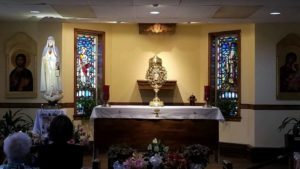 Perpetual Adoration Chapel Adorers Needed Commit 1 hour/week, immediate coverage needed: | Sat 8 AM 5 PM | Sun 5PM. 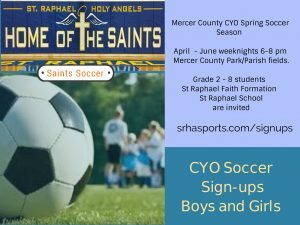 Contact John Margicin, 609-585-3848, or drop off the sign-up form at the Chapel. If you are bilingual and have a love for teaching youth about our faith, please volunteer to assist our Children’s RCIA classes on Mondays from 4:00-5:00PM. Adult RCIA classes will start on October 16th. Classes will be held Tuesdays from 7:00-8:00PM in the Spiritual Center. 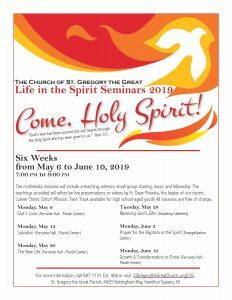 Children RCIA classes are full for this year. The third Family Gathering/Sacramental Sunday will be held on February 24th for all second and eighth graders and all Summer CCD classes. Food Pantry Outreach Sat, 9-11 AM at Parish Center | Volunteers welcome ! | Outreach dates 3/9, 3/23, 4/6 (Easter distribution), 4/27, 5/1 and 5/25. Healing Mass.The monthly Healing Mass is on third Fridays of the month, from Sept. to June (except Lent) 6:30 pm. NO HEALING MASS DURING LENT. Social Concerns Committee: Trenton Area Soup Kitchen Our next serving date in 2019 will be Wednesday, May 29. 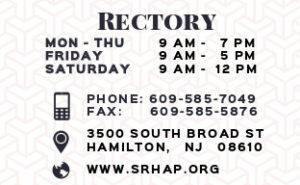 We meet in the St. Raphael parking lot at 9:45 am for carpooling to Trenton, and return about 1:15 pm. Remaining Service dates – May 29, July 31 and October 30. For more than 25 years this Parish has fulfilled our commitment to help serve the noontime meal at TASK whenever there is a fifth Wednesday in the month. Congratulations to all who have taken part in this wonderful tradition over the years. Returnees and first-timers are always welcome! New Altar Servers 3rd -12th grade needed Training will be provided. Contact Fr Gene 609-585-7049 ext 100. Sacristans – Adult Servers Needed Commit to serve on Daily Mass (Day or Evening) single/multiple days. Training will be provided, contact John Margicin 609-585-3848. 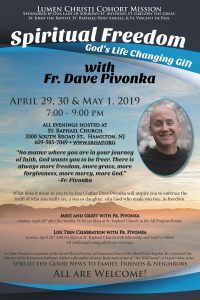 Parish Sing-Along Friday, – After a winter hiatus the Sing-Along with Frank Bresnen on guitar, Manny Chaconis on drums, and Bill Franko on banjo will return in April.